Your winter alternative – the cat’s out of the bag! Winter is known for being a difficult time for fishing. Most days you will work hard to manage few fish and even blank some days. What many anglers are unaware of is that there are alternatives and that you can have a good day’s fishing in the winter. So what is this alternative option? It takes the form of a long black beast known as a catfish. Catfish are the strongest freshwater fish in our waters. They take line off a locked drag with ease resulting in a proper fight and a good dose of “viskoors”! Many of you have probably experienced a tussle with one of these brutes thinking it was the bass of your dreams only to be let down as a catfish surfaced next to your boat. Yet it is undeniable that you enjoyed the fight with the beast. I detest the freezing cold mornings that come with winter fishing, but I always look forward to experiencing several awesome catfish trips. When the cold sets in the green pea soup water of dams like Harties, Roodeplaat and Roodekopjes becomes crystal clear – excellent for sight fishing! At these venues catfish loves to move into the shallows during the warm afternoon to bake in the sun. On most cold winter days you will find shorelines packed with cruising and suspended catfish. 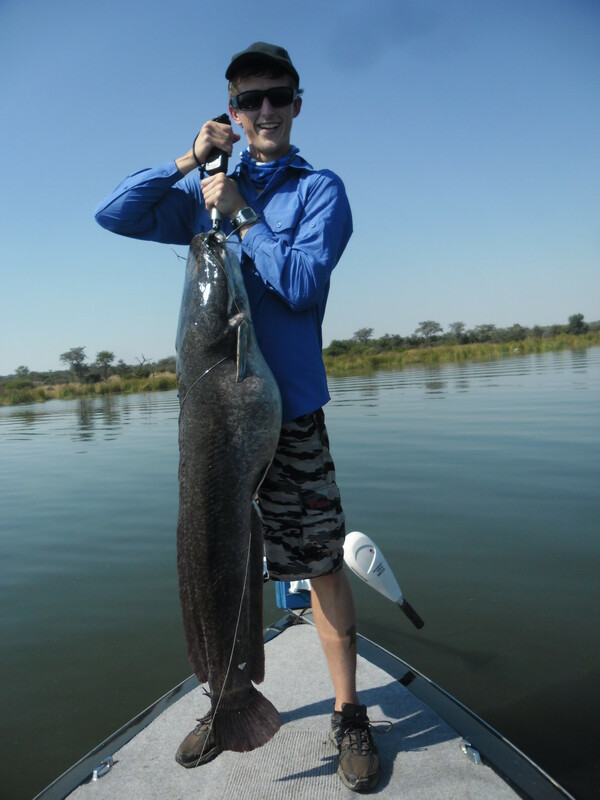 On a good day one can easily catch up to 30 catfish ranging between 2kg and 15kg, each one pulling harder than the last! Catching these brutes in the winter is all out sight fishing! Therefore, you need to quickly cover a lot of water to find them. Catfish usually lay on shallow flats with sandy or rocky bottoms. They can lay in surprisingly shallow water right next to the shore, in as little as 10cm deep water or lay a bit deeper in up to 2m water. It doesn’t matter how deep they are, as long as you can see them you will be able to catch them. 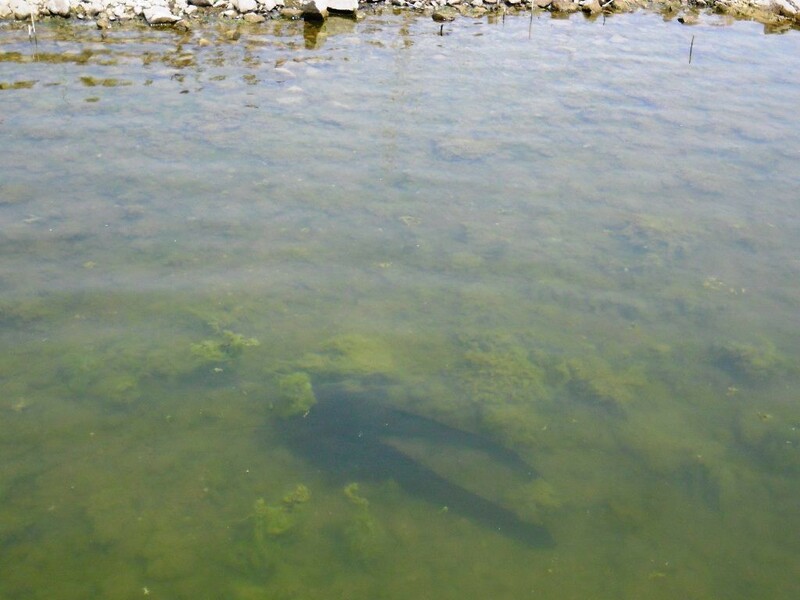 Water clarity plays a major role in targeting catfish effectively. The colder the winter, the more algae dies and the better the water clarity. Some winters the dams don’t clear up entirely, although there are always clear patches somewhere in the dam. It is usually good to check the wind as the wind forces the algae to build up in certain areas. If you fish above the wind you will find clear water. Once you find the catfish, you get them in large numbers occupying long stretches of shore just waiting to be caught. So how does one go about catching these black brutes? Two methods are used, known as casting or dipping. I’ll start off with the more familiar method. For the casting method a similar setup to that of catching bass in thick structure as at Letsibogo is needed. A medium heavy or heavy 7ft casting rod fitted with a low profile baitcaster and loaded with 50 to 65lb braid is the right stuff. Lighter line can be used, but be warned – you will be schooled! I use a 7ft Shimano Clarus fitted with a Shimano Curado 200E loaded with 50lb Seaguar Smackdown. A swimming jig with a strong hook is required for this setup. I recommend Goya’s Heavy Cover Jig. 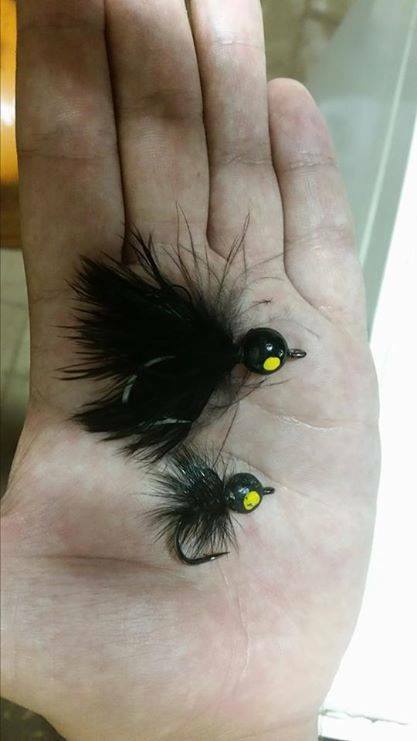 Remove the hook protector which makes the jig weedless, as it results in failed hook-ups. This method works particularly well at Roodekopjes and Loskop Dam where the catfish lay on open flats with minimal structure. Often at these venues you will find the catfish on white sandy bottoms where you can easily spot them as these pitch black fish form a contrast on the white sandy bottoms. Once spotted, you need to cast your jig far past the catfish, quickly reel in with your rod tip straight up while retrieving your jig on the surface until it is above the catfish’s whiskers. Drop your rod tip with the purpose of “landing” your jig on its whiskers. This may take some practice, but soon enough your jig will be engulfed as the brute puts your tackle to the ultimate test! The second method is known as dipping and requires a catfish calling rod. I prefer using the Blue Marlin Big Shot 13ft calling rod fitted with a 250 Shimano Culcatta and loaded with 100 to 150lbs braid, like Seaguar Smackdown or Berkley Whiplash. A Lume Catfish leadhead is used as the lure. You might ask why such a long rod is used? The reason is because you want to drop your leadhead on the unwary catfish’s whiskers and often need a long rod to reach them before they notice you. Sunbathing catfish are super skittish and will spook from the subtlest noise, movement or disturbance. Using the dipping method is ideal when you have to catch these fish in structure, e.g. when they are laying in sludge or vegetation. The calling rod enables you to have complete control over your lure while trying to drop it on a catfish’s whiskers. Usually you only get one shot on an unsuspecting catfish and therefore your accuracy needs to be on point. When you drop your leadhead successfully on a laying catfish, you will see a white flash as the catfish opens up its gills and engulfs your lure! You need to stand your ground as even a small catfish can easily pull you off your feet. This is truly a spectacular way of fishing that will get your blood pumping and leave you wanting for more! Lastly I would like to emphasize that you need to drop your leadhead or jig straight from above onto the catfish’s whiskers. Don’t drag your lure onto their whiskers from the side. If you drop it off target, it is better to cast again or dip again than to try and drag the lure onto their whiskers as this will only cause them to spook. Remember that winter catfish offer reaction strikes which are initiated when something falls ON their whiskers. It is a good idea to have a vinyl carpet on deck which prevents the catfish from dirtying your deck whilst unhooking it. A glove, lip grip and Rapala Hook Remover will also make your life much easier. Now that you know the secret you can turn a dull winter trip into an enjoyable day on the water! Hi there I just want to ask if you use the old method of using chicken liver and hart’s does it also work still and do you go deep or shallow? I have tried it a few time but nothing wants to eat I was at witbank dam and also bronkhorstspruit dam can you please help me out a bit thanks. Sorry Tinus, I only use artificial lures so I really can’t help you out on this subject.